In small bowl, sift together the gluten free flour and xanthan gum. Add gradually to the butter mixture. Mix until well combined. TIP: Unless you want a real arm workout, use an electric mixer. The cookie dough is quite dense. WARNING: The raw cookie dough will taste and smell like green peas. Once baked, however, this will completely disappear. Scoop the dough by the tablespoon. Roll each into a ball, place on cookie sheet and flatten slightly with fork or the bottom of a glass. Bake for 8 – 9 minutes or until edges are just turning golden brown. Follow the recipe instructions for regular cookies above. Before baking top each cookie with a crushed lime flavoured life saver candy. Yummmmmm. Roll out the cookie dough to approx. 5/16” thick. Using a cookie cutter cut out rounds and place on cookie sheet. Bake for 6 – 7 minutes. Remove rounds from the cookie sheet to cool. TIP: Roll the dough between 2 pieces of parchment paper to keep it from sticking to your cupboard and/or rolling pin. Refrigerating the dough for a couple of hours before rolling also helps. Once fully cooled and hardened, flip one cookie on its face and coat the bottom side with icing. Place a second cookie face up on top. Decorate the top of the cookie if desired. Leave to cool. TIP: Make the decorations on a piece of parchment paper and let them harden. Then carefully remove them from the parchment and, using a drop of icing, “glue” them onto the top of your cookies. For the shamrock decoration, we used a pastry bag with a fine tip. Roll out the cookie dough to approx. 5/16” thick. Using the round or bottom cookie cutter cut out rounds and place on cookie sheet. Bake for 6 – 7 minutes. Remove rounds from the cookie sheet to cool. These cookies will spread while they bake so to make the linzer-style cookies as seen in the main photograph, you will need to trim them up by recutting them. While still warm, recut half of the cookie rounds with the bottom cookie cutter. Now recut the other half of the rounds with the top cookie cutter from a linzer cookie cutter set. TIP: If you don’t have a linzer cookie cutter you can use a large regular cookie cutter for the rounds and a small cookie cutter of whatever shape for the centre. Remove the left-over “rings” of cookie and let the rest cool and harden. TIP: Place leftovers in a bowl and set on kitchen table. Within minutes, they will have somehow completely disappeared! Once the cookies are cooled and hardened, flip the bottoms onto their faces. Place a dollop of icing in the centre of the cookie. Set the tops (face up) onto the icing and press gently until the icing spreads and rises up into the cut out. 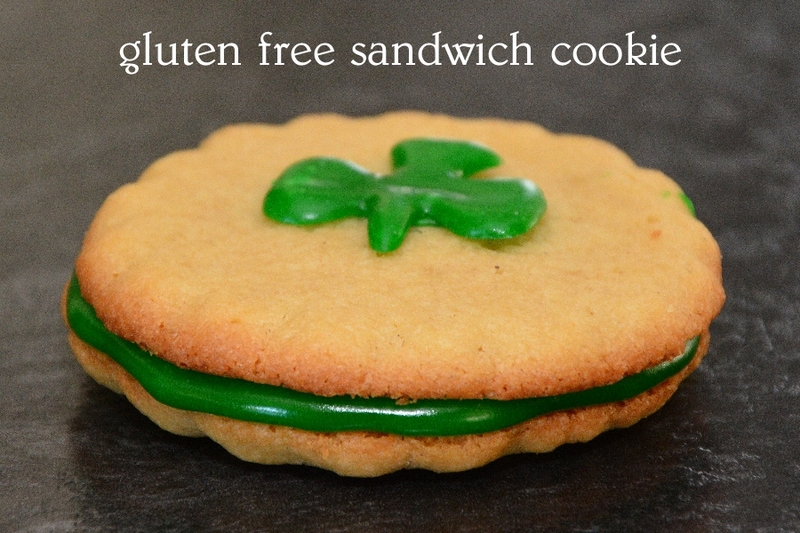 TIP: We used a store-bought gluten free cookie icing, but you can use your own as well just make sure it is a soft icing that will spread without breaking the cookie when pressed together. Let set and then serve. 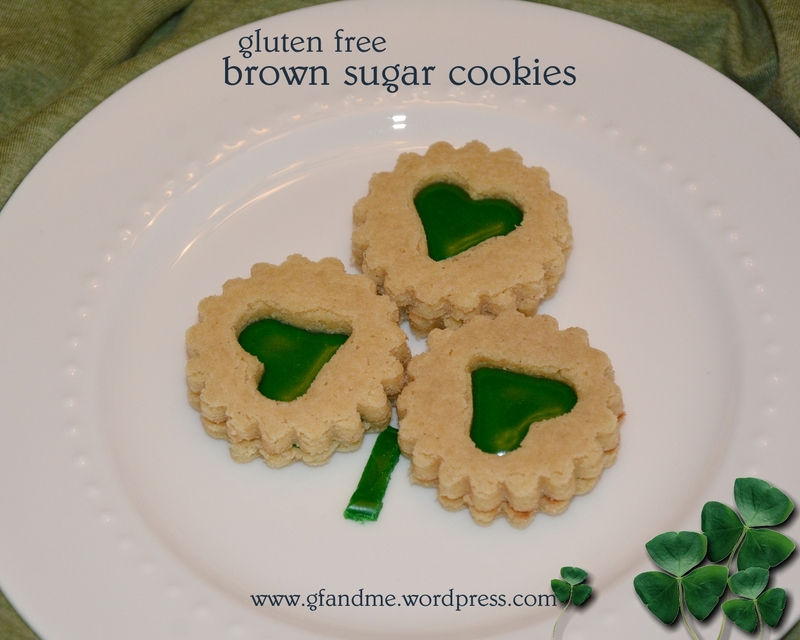 This entry was posted in Baking, Recipes and tagged bob's red mill gluten free flour, cookies, gluten free, holidays. Bookmark the permalink. I’m all about having breakfast to go in the form cups or muffins. Even better when it’s bacon, potato, and cheese my WEAKNESS! How cute are those cookies?! I have everything in my pantry to make these! How cute. 🙂 I love the sandwich cookie. Thanks. They were fun to put together. Adorable! I’ll have to try that! Thanks! Hope you enjoy them as much as we do! They are a conversion of one of Geoff’s mom’s recipes.